Eggs are something that never held any appeal for me. They were always too ‘wiggly’ and I had no interest in them. And then I had Tortilla Espanola. I was on a yoga retreat in Spain, staying at the house of an incredible chef who would cook us these grand brunches every single day. One of those days he was serving Tortilla Espanola, and I had no idea what it was but I was intrigued. It looked like a frittata made of mostly potatoes and a little bit of egg to hold it together and you put a potato in front of me, I’ll eat it. So I took the tiniest sliver possible. 1/2 inch of tortilla slice. And then another one. And another. I was obsessed. About a year went by and I had no idea what this thing was, I didn’t know how to research it, I didn’t know what to call it. All I knew was it was a giant round omelette filled with potatoes and I looooved it. This past fall, I was reminiscing about my trip to Spain with my new boyfriend who had spent a good amount of time there and loves loves loves the food culture there. I was like, '“Did you ever have that thing that’s like an omelette but not really and it’s all potatoes and it’s so good?” He immediately knew what I was talking about and made it for me that night. That was it for me folks. Hook. Line. Sinker. Tortilla has become a staple in our diets these past few months, it’s delicious, simple, can be made ahead of time, takes three ingredients, and best of all we get to put ketchup on it. Tortilla is the thing that got this picky girl to even eat omelettes that don’t have potatoes in them- I’ll even eat plain old eggs now if they’re cooked just right! You can add a few slices of onion in when you’re cooking the potatoes but I love it just how it is. Personally, I can’t get enough of Vital Farms eggs (this is not an add, I just taste the difference in pasture raised and you can even see it- the yolks are a completely different color). It’s worth paying the $5-6/dozen. The recipe will still be under $10 for a tortilla that will feed at least three maybe four. Start by slicing the potatoes (longways, you want the slices to be long so they stack better) a little less than 1/4 in thick. If you have a mandolin, even better! You don’t have to peel the potatoes as long as they’re cleaned well. In a 9” NONSTICK saucepan, heat the olive oil over medium heat for about two minutes. Drop the potatoes in all at the same time, season with salt and pepper and let them cook over medium heat for about 20 minutes, flipping the potatoes every 3-5 minutes or so until they’re just about cooked through. You don’t want the potatoes to brown, you just want them to be a little bit tender. Crack the eggs into a separate bowl and beat the heck out of them for about a minute before pouring the eggs over the potatoes in the pan. Lower the heat to low and allow to cook, uncovered, for about ten minutes until the eggs begin to set. If you’d like, you can run a rubber spatula around the edges of the pan to make sure the eggs aren’t sticking. Once the eggs are about set in the middle, flip the whole tortilla onto a plate, (do this over the sink just in case!!) slide it back into the pan, cooked side up, and cook over low flame for another 5 minutes or so until the bottom is set well. Serve hot, at room temperature, or even cold straight out of the fridge the next morning! Let's talk about babysitter slices for a minute. You know, the kind you take when you're babysitting and they have MUCH better snacks at their house than you do at yours. I'm talking entenmanns fudge frosted cake. Or like two day old glazed munchkins. The best houses though are the ones with a tray of boxed brownies. Shiny and crinkled studded with chocolate chips. You would slice off millimeter by millimeter of those brownies so the parents wouldn't know that you ate all of their snacks, right? Now, as a functioning adult, I am totally aware of the fact that the parents would not give a hoot about whether or not I was eating their snacks. In fact, they probably would want me and my 15 year old metabolism to help them with that tray of brownies. But for whatever reason it felt like a scandalous secret to sneak slices of sugar after the kids went to bed, did it not? These brownies are reminiscent of that simple add oil water and egg boxed mix you made when you were a kid except they're about a billion times fudgier and gooier and yummier. Preheat the oven to 350 and line an 8" square pan with parchment paper. In a different bowl, whisk together the eggs, cocoa and vanilla for about a minute until super smooth and glossy. In a medium saucepan, melt the butter and sugar over medium low heat whisking constantly. Don't let it bubble! Keep it low until the sugar has dissolved! Rub a tiny bit between your fingers to see if it's smooth. Slowly stream the melted butter mixture into the egg/cocoa mixture while whisking constantly until combined and then whisk for another whole entire minute- this is what will give you that glossy cracky top! Fold in the dry ingredients juuuuuust until combined, tossing the chopped chocolate near the end and folding that in too! Spread evenly into the parchment lined pan and bake for 25 minutes, until the center is just set and doesn't jiggle when you wiggle the pan. Let cool in the pan or be impatient like me and dig in with a spoon and burn the roof of your mouth with melted chocolate, both ways are totally okay. 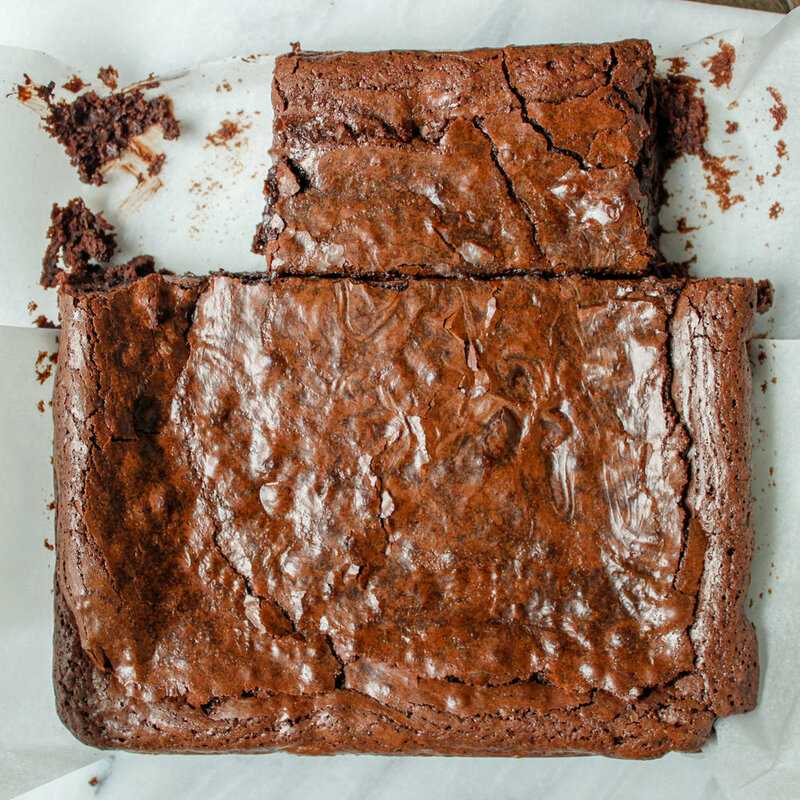 Let's go have some brownies about it, shall we? Two of my Christmas gifts from the year 2000 have proven to be timeless so far. My bike (I'm still riding a kid-sized 21 speed Raleigh and I LOVE it), and my Grinch Waffle Iron. This waffle iron made our house the sleepover house. That, and my mom was the sleepover queen. We could stay up as late as we wanted as long as we were dancing with her. She would let us use air mattresses as slides, she would have a craft ready for us to do, she made the comfiest beds on couches to sleep on and in the morning- she always made grinch waffles. Much more exciting than your standard belgian waffle, grinch waffles were a topic of discussion. The swirls that the syrup could swim through- the perfect circle in the middle for a pool of butter or whipped cream. My mom was also the cool aunt. The one who let my little cousins and I eat whipped cream straight from the can at 8am. My mom didn't have lots of rules, she mostly just did whatever she could to make sure everyone around her was having the most fun at all times. cooking spray, for waffle iron. In a blender, combine all ingredients and blend until smooth. Add more almond milk a tablespoon at a time if it doesn't seem like it will pour smoothly until it's pourable. Heat the waffle iron and spray with cooking spray. Pour about 1/3 cup of batter into the iron and cook for 3-4 minutes, until golden brown. Serve with a dollop of coconut cream (which you make by refrigerating a can of coconut milk and scooping off the thick creamy white part from the top) and maple syrup. I serve it like this for the nostalgia of when you get a waffle at a diner served with an ice cream scoop full of butter. This batter can be refrigerated for up to 2 days! Add a bit more milk to thin out before using. It wouldn't be fair to this dessert to call it a brownie. There are hundreds of health food junkies out there running around calling recipes similar to this 'Sweet Potato Brownies' but that's just not okay. Because a brownie- a brownie needs to be dense. 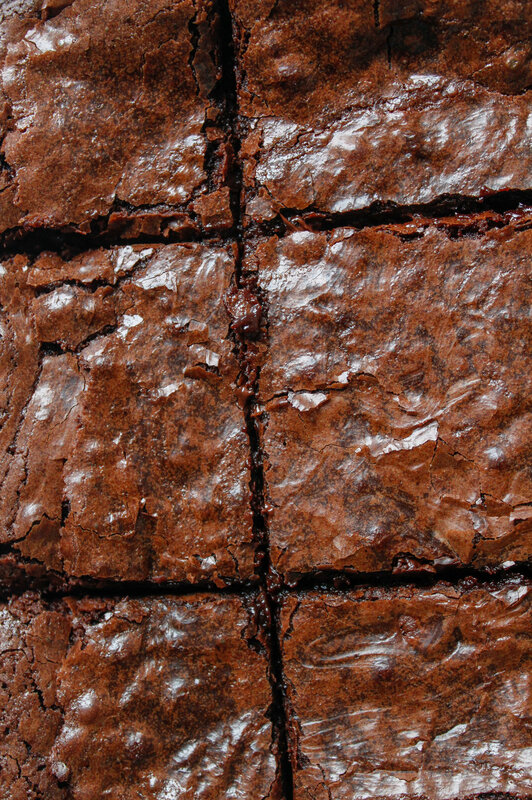 A brownie feels like dead weight in your hands. It sticks to the roof of your mouth it's so fudgy. It has a crackly shiny top and just a 1" square is enough to satisfy. 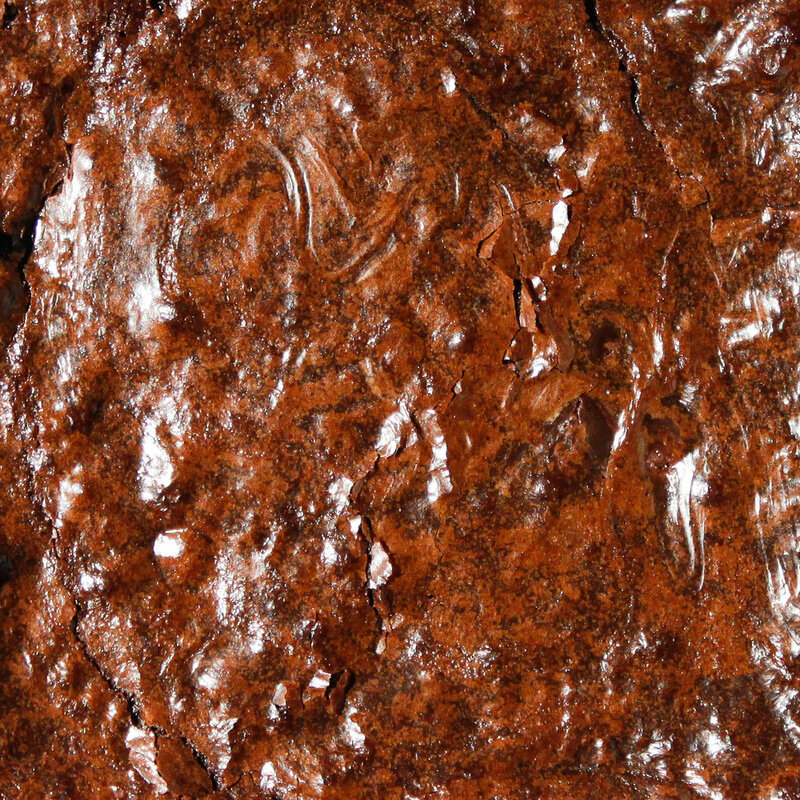 That doesn't mean there's anything wrong with what this is- it's just simply not a brownie. It's a light, fluffy chocolate cake with a depth of flavor and ZERO DAIRY, GLUTEN or REFINED SUGAR! Are you kidding me? I wouldn't have believed it either. This cake is unbelievably decadent and moist and you won't even miss the sugar- I promise. Start by making the flax egg- in a small bowl combine the flaxseed meal and water and set aside for five minutes until it firms up. Preheat the oven to 350 and line an 8x8" pan with parchment. In a medium bowl, combine the almond butter and sweet potato with a fork or whisk until smooth and creamy. Whip in the flax egg and maple syrup until combined. Whisk in the cocoa powder, vanilla and baking soda. Pour the batter into the parchment lined baking pan, bake for 25-30 minutes until a toothpick inserted in center comes out clean. Once the brownies have cooled completely in the pan, prepare the peanut butter frosting. DO NOT SHAKE the can of coconut milk. Open the can and scrape the top into a small bowl, saving the transparent liquid in the fridge for smoothies at another time. Beat the coconut cream until it's light and fluffy like whipped cream. Set aside. In a medium bowl, beat the coconut manna with the peanut butter and maple syrup until completely combined. Fold in the whipped coconut cream until smooth and spread over cooled cake. Store cake in fridge until you're ready to serve. Prepare for people to propose to you when they take a bite. And then tell them it's made with all wholesome ingredients! There are plenty of words in the English language that I avoid saying altogether. Having grown up in a very Italian area, I am distraught when I have to speak, "ricotta" aloud. Mozzarella is not a simple one either. Don't even get me started on bruschetta. The worst part is, I loved Italian class more than all of my others. I love love love the language and I know how to annunciate these things properly, I just know I'm opening myself up for unwarranted ridicule by doing so. Sherbet fits in that category too. It's a word that sounds wrong no matter how it falls out of your mouth. The kind've word that when you order it at Friendly's, you just point to it on the menu to dodge the discomfort of saying it out loud to your server and everyone else around you. The best part about this being a blog and not a Youtube channel is that I get to share this magical recipe with you and none of us have to say the word. Which most definitely is not sher-bert. I see you in your mid-summer glory, cubed melon sitting in the back of your fridge that's juuuuuuust starting to get a tiny bit slimy around the edges. Not slimy enough to throw out yet but also not crisp enough to eat right now. Let's do something about it, shall we? I made this with nothing but watermelon but I suspect it would work well with cantaloupe and honeydew as well, or perhaps a combination? MAYBE A MANGO?! You don't even know it yet but you're like an hour away from the dreamiest creamiest fruitiest sherbet on the block. *This is a rough estimate because we all have a different definition of cubed. My cubes are about 1". For me, this was 1/2 of a smallish watermelon (not a personal tiny one, a regular small one). In a food processor, combine all three ingredients and process for about five minutes until all of the chunks and seeds have been swallowed up by the sea of pink. Freeze in an airtight container for about 3 hours before serving. I served mine with cacao nibs and lime zest, reminiscent of the ever-nostalgic watermelon roll! I started my first business when I was 14 without having ANY idea what I was getting myself into. It really all started when I was in 3rd grade, and I really REALLY wanted the book "A Smart Girl's Guide to Money" from the Scholastic Book Fair (best day of the year). I think this might've been the only time I ever once in my life heard the word 'no' from either of my parents (I am extremely lucky and I know it). It was the best no I could've ever gotten. My mom's reasoning was that she always bought me these books that I never read, and that if I really cared that much about this book I could take it out from the library and take notes on it. I ended up doing exactly that, filling out an entire spiral bound notebook that I titled, "I Wanna be an Entrepreneur" and that was it for me. I wrote business plans for everything from a birthday party business, to a craft summer camp that would be held in my backyard (I was planning on being the head counselor at eight years old), to babysitting services (again- I was 8). I am so grateful for that no, because without it I would not have read that book nearly as thoroughly as I had to when I was copying it down into my notebook. Fast forward to the end of 9th grade. I had been decorating cakes with my mom for a few years for various cousin's birthdays, communions and every holiday under the sun. I decided that I had gotten good enough at my craft that people were going to pay me for it! It can't be that hard, right? At the time it felt so simple, all I had to do was say, "hi, this is a thing I do and you can pay me for it". So I did what anyone would do in 2009 when they want to get paid for something, I created a blogspot website complete with prices and a few photos of my creations and Plays With Food went live. I had the lemonade stand effect at first after handing out my first batch of business cards (actually business magnets) to everyone within a 1/2 mile radius of Wantagh High School. People ordered cupcakes and cakes from me because I was undeniably sweet as pie and it was cute that I started a business. Looking back at my work, it wasn't all that great and to be honest most of it was made from a box with canned frosting. It might've been full of processed sugar and strange stabilizing substances, but it was also full of passion and drive and effervescent love that only a kid can create when they are excited about something. I remember the first time someone told me I wasn't charging enough for what I was doing- I was handing Mrs. Harclerode her daughter's communion cake for 100 guests that I had charged her $60 for, which I felt pretty good about at the time! Holding three $20's feels like a lot when you're 16 and you seemingly made this money appear out of thin air by doing something you love! She took the cake from me and with the most genuine shock looked at me and said, 'you should be charing $200 for this cake!'. That's when I started taking myself seriously. I switched to scratch-baking almost immediately and realized that this was more than a fun thing I did for the heck of it. Here I am, nine years, thousands of cupcakes, countless wedding cakes, dozens of baby showers and first birthdays and Christmas pear tarts later- diving back into the catering world. I took a bit of time off to explore being a young twenty something, traveling alone and staying up until the sun came up and moving across the country. I took time off and realized that I miss it. I miss being part of everyone's celebrations. The happy days- the ones where people that love each other gather and eat and drink and be merry. Here I am in Denver, starting where I started almost a decade ago- a little less naive, a little more serious and a LOT more stoked to join your party. Let's have some cake about it, shall we? Grease and flour three 8-inch cake pans, preheat the oven to 350. In a medium bowl, whisk together the gf flour, xanthin gum, cornstarch, baking soda, baking powder and salt. In the bowl of a mixer, combine the sugar and lemon zest. Rub together between your fingertips until the zest is evenly distributed and the sugar is fragrant. Beat the butter and sugar until light and fluffy, about 3 minutes. Beat in the egg whites, egg and vanilla, scraping down the sides of the bowl and beating until everything is totally combined (about 1-2 minutes more). Slowly stir in 1/3 of the flour mixture juuuuuust until combined. Now slowly add 1/2 of the buttermilk (or almond milk mixture) and stir just until combined. Repeat with 1/2 of the remaining flour mixture and the rest of the milk, finishing with the last of the flour mixture. Distribute evenly between the three greased baking pans and bake at 350 for 25-30 minutes, until a toothpick inserted in the center comes out clean and the top springs back when lightly pressed into with a finger. Let cool in pans for no more than five minutes before turning out onto a cooling rack to cool completely. While the cakes are cooling, make the blackberry filling! In a small saucepan, combine the blackberries, lemon juice and sugar. Bring to a simmer over a medium flame then lower the heat to low and keep bubbling for about ten minutes, until the berries start to break down (you can push a few of them against the edge of the pan with a fork to help them along but don't break them all up!). Whisk in the teaspoon of cornstarch then remove from the heat and allow to thicken. Let this cool allllllll the way down before assembling the cake or you will be a very sad baker. In the bowl of your stand mixer, slowly mix the softened butter and confectioner's sugar until it's all cohesive. Once there are no more bits of sugar flying around your kitchen, crank up the speed on the mixer to high and add the vanilla. Let that go- scraping the sides of the bowl once in a blue for about five minutes. I mean it, five minutes. You want this buttercream to be hella fluffy. Level any layers that need leveling. What I mean by that is, get eye level with your cakes on their cooling racks and if they have a huge dome you're gonna want to cut across the top to make them all even. Place a little dollop of buttercream on the center of the platter you are assembling the cake on, center the first cake on the platter. Using a piping bag, pipe about a 1/2 border of frosting around the top edge of the cake (almost like you're making a fence to hold the filling in, which you are). Pipe a small amount of frosting inside the fence you just made and spread it out evenly so the entire topside of the cake is frosted. Spoon about half of the blackberry mixture on top and spread that out evenly as well. Top with the next cake and repeat this whole process. Now you should have a three-layer, unfrosted cake. Dollop about 3/4 c of frosting on top of the cake and start spreading out until you get to the edges, then spread along the edges to kind've seal the filling in. Here's where you get to have some fun with it. I kept the top of my cake extra frosted and took a spoon to add bits of the leftover filling to the cake as I was frosting it to create that streaky thing that you see. You are the artist. This is the cake that you get to be the boss of. Go ahead! Tag me on instagram if you make this one @audreygebhardt, I'd love to see what you come up with!